Black Bears on the brink of an NCAA bid? UMaine’s Sigi Koizar drives against Albany during a regular season game. The University of Maine Black Bear women haven’t been to the NCAA Division I tournament since Cindy Blodgett and Jamie Cassidy were roaming the court for Maine in the late 1990s. But Maine has a great shot at getting an automatic bid by virtue of its stellar play in America East this year. 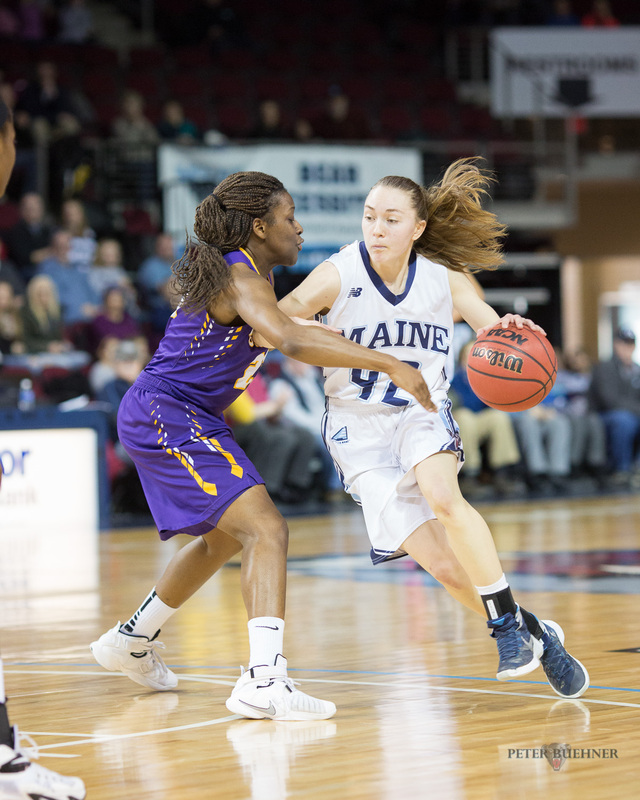 The Black Bears’ only conference loss this year came at the hands of the University of Albany, with which Maine shares the America East regular season conference title. Overall, the Black Bears are 26-7 and are riding a 14-game win streak after they hung on for a 51-48 win against Stony Brook in the conference tournament semifinals on Sunday. Of course there is one more obstacle to overcome before the Black Bears can earn that NCAA bid: a rubber match with the University of Albany next weekend in the America East conference championship game. Against Albany, Maine lost the first meeting Jan. 16, 64-59, as Albany 6-1 senior Shareesha Richards scored 34 points to single-handedly beat the Black Bears. The second time they met, in Maine on Feb. 14, the Black Bears’ stingy defense held Richards to 8 points, as Maine prevailed 65-53. To put this turn-around in perspective, Richards, who grew up playing netball in her native Jamaica, has been considered the best player in the entire America East conference since she was a sophomore and is projected to be selected late in the first round or early in the second round of the WNBA draft. Meanwhile, offensive rebounding and lock-down defense have carried Maine to this America East tournament final. They’ve held opponents to under 50 points per game, which is 4th in the NCAA this year. A case in point was the past weekend’s quarterfinal win over the University of New Hampshire Lady Wildcats, 58-47. New Hampshire was 16-20 this year and has a team made up mainly of underclassmen. But Maine and New Hampshire are neighboring states and the two teams are arch rivals. Games between the two are often hard-fought affairs settled by single-digit margins, no matter the overall records of the teams. UNH senior star Elizabeth Belanger kept the Wildcats within 3 to 6 points of Maine for most of the game (with 24 points off an assortment of pull-up jumpers and off-balance leaner’s). But time after time Maine’s defense limited the Wildcats to a single shot – and on several occasions those single shots were desperation throws with the shot clock winding down. As for its offense, Maine’s super-senior Liz Wood, an America East all conference second team selection, added a double-double with 13 points and 10 rebounds. She also added 4 steals to her regular season total of 78, which is 21st in the nation this year. Maine’s junior guard, Sigi Koizar, an America East all conference first team selection, offset Belanger’s scoring with 23 points on 50 percent shooting. She also dished out 4 assists. 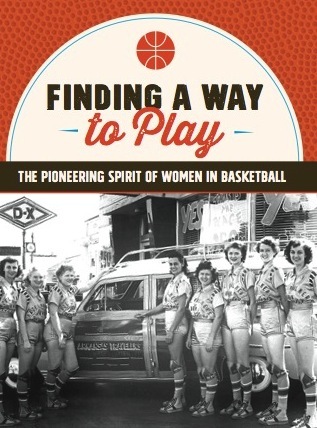 Koizar is to this Maine team what Cindy Blodgett was to her NCAA-bound teams in the 1990s: the go-to player that can make things happen with an outside shot or a drive and dish to an open teammate. A native of Vienna, Austria, Koizar is one of eight international students on the UMaine team. Coach Richard Barron made the decision to rebuild the team with overseas talent when he took over for Coach Cindy Blodgett after she was fired as Maine’s head coach in 2011. Only two of this year’s team members hail from Maine. The European countries represented on the squad this year are Austria, England, Serbia, Sweden, Finland, Greece, Italy, and Germany. Out of necessity, the Black Bears have learned how to communicate both on and off the court. The team took a trip to Italy last offseason, a bonding experience that has obviously paid off. They’d love to take at least one more trip together this season – this time to one of the sites of the NCAA Division I regional opening rounds on March 18.